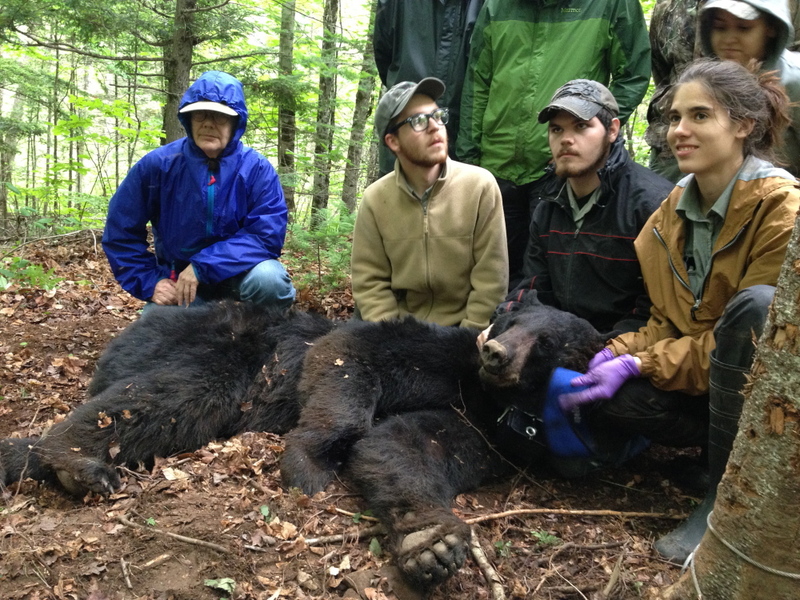 Students on a two-year project hope to make a significant contribution to the study of Maine's bears. UNITY PLANTATION — The worst part is when the bear lunges at you. 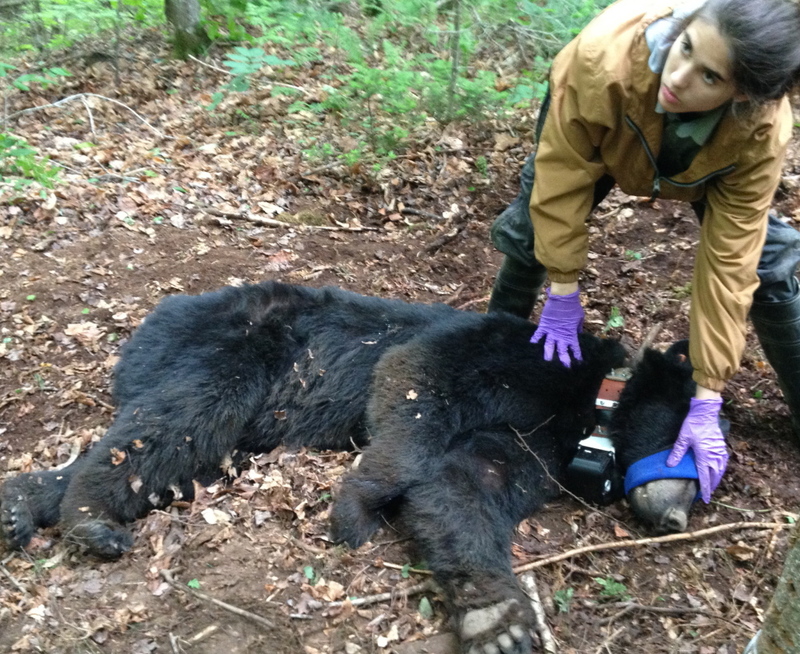 That’s according to Jonah Gula, one of about a dozen Unity College students who trekked deep into a 4,000-acre patch of woods off Route 139 Thursday morning to help figure out how to get a video collar onto an angry bear. 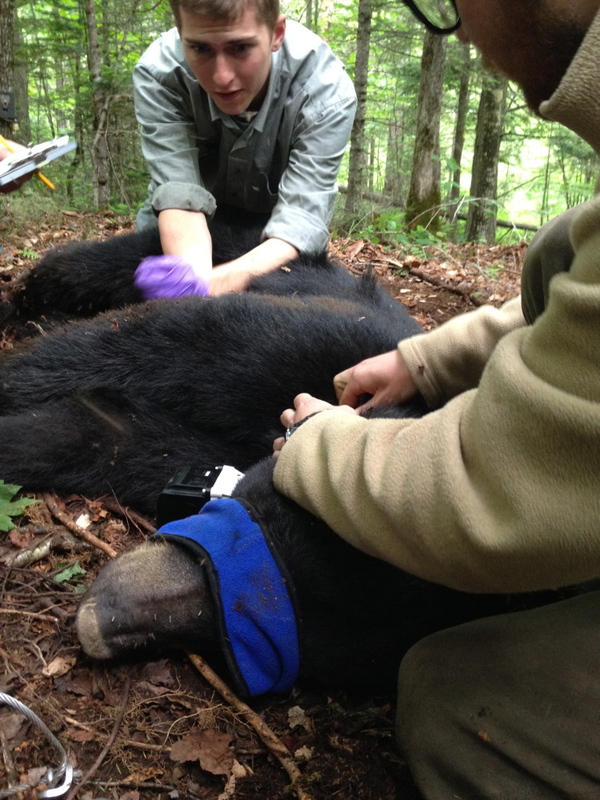 The student research team has been studying bears for nearly two years, but its ultimate goal – to get a video collar on a black bear and ultimately see images taken from an ursine point of view – had not yet been attained. The students, who hope to move on to careers as wildlife biologists, stood on a logging road, wearing rubber boots and nylon jackets. 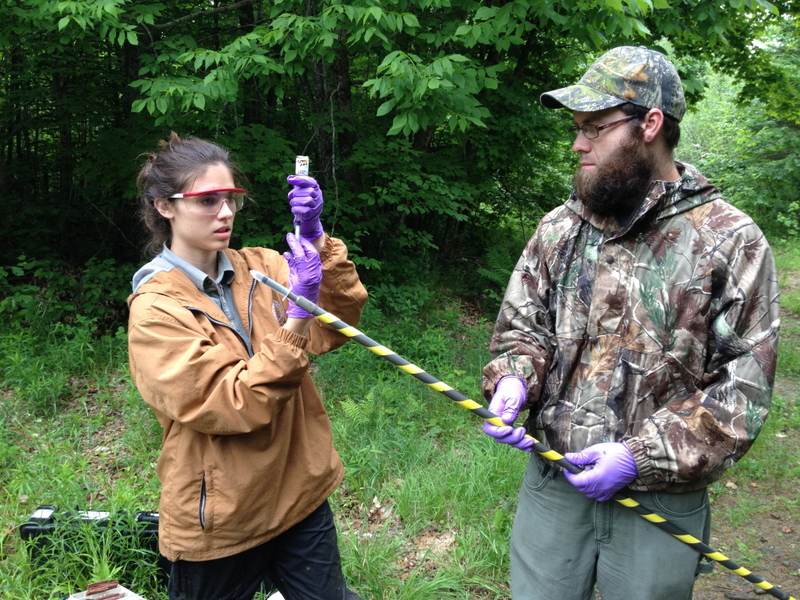 Their instructor, Unity College’s George Matula, disappeared with a couple of students into the thick growth to assess the bear, trapped in a snare about 50 feet away. Speaking in whispers so as not to rile the bear any more than was necessary, Gula explained that he hoped the catch was female, which would likely give the team pictures of cubs. A student brought back word – the bear was a male, about 180 pounds. It already had an ear tag identifying it as UC-14, a bear they had captured a week earlier in the same area. 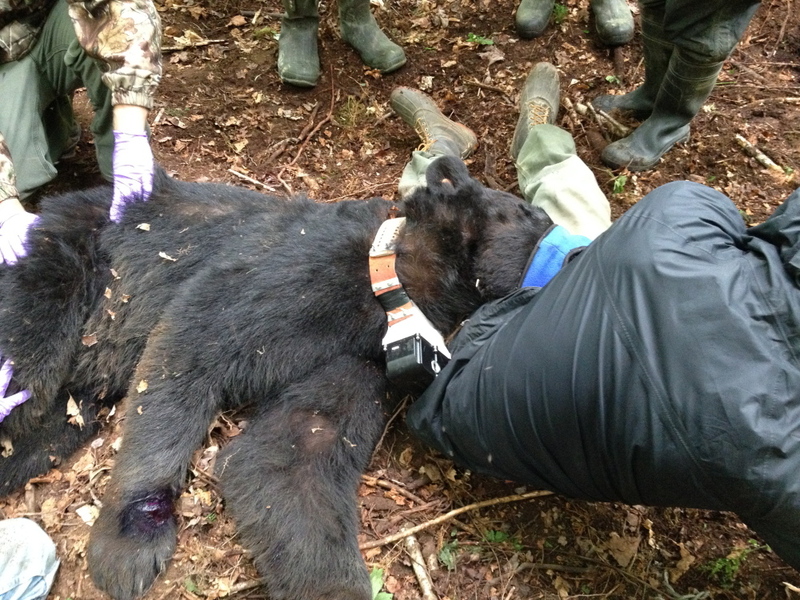 They planned to deploy the video collar anyway – with no guarantee the team would capture another adult bear in their last few weeks in the field, a male was better than no bear at all. Based on UC-14’s size, Kari Lemelin, another returning student with the program, prepped a syringe with a drug cocktail. They planned to hit the bear with muscle relaxants, a chemical to unhinge its mind from its surroundings and an amnesiac agent so that it wouldn’t remember the negative experience once it was released. The syringe fit into the end of a 9-foot-long pole that would allow Lemelin to deliver its payload without being bitten. Behind the treeline, the bear had been drawn to the area by a bag of bait that included doughnuts and a rotting beaver carcass. 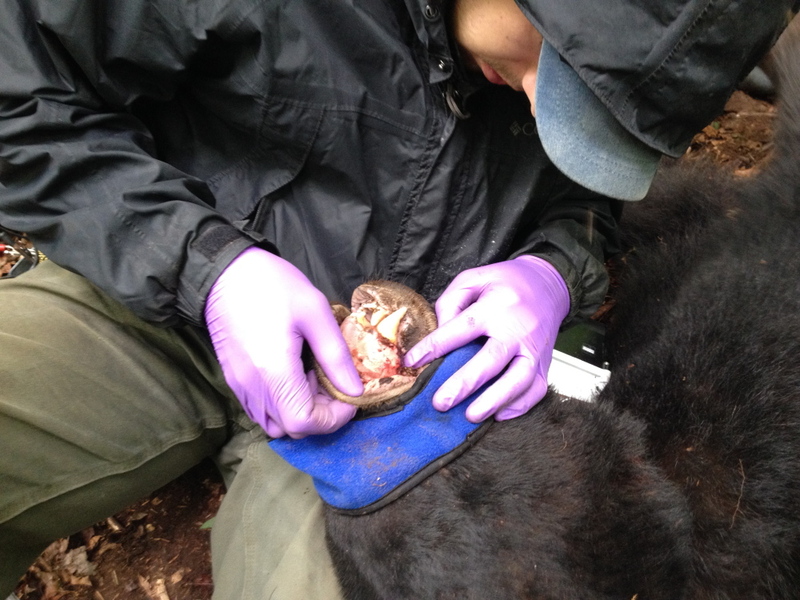 But instead of an easy meal, its foot had been caught in a snare laid by the team. While trying to escape, the bear churned up the leaf cover and forest mulch around it, leaving a wide circle of disturbed soil. Called the capture circle, the area defined the reach of the bear, which was important to the person whose job it is to distract the bear from Lemelin, said Gula. That person stands just outside of the capture circle, facing the bear. If they lunge, Gula said, backing away can excite the bear even more, so it’s important to stand there, facing the bear’s charge calmly. When the bear charged, Lemelin struck it from behind, spearing the bear high on the rump with the syringe. Out on the logging road, the bear’s reaction could be heard – not a roar or a growl but a sharp, chuffing intake of breath followed by a rapid exhalation. The needle broke, leaving the team members without any way to tell how much of the sedative the bear had actually received. 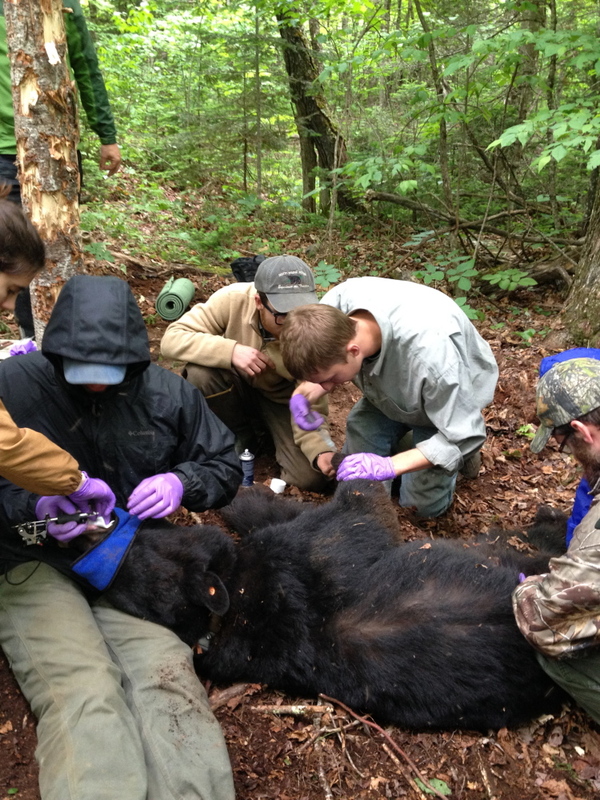 About 10 minutes later, when it became clear the bear was not going to sleep, Lemelin returned to the group on the logging road and prepared another syringe with a smaller dose. On her second jab, the bear felt the needle and turned lightning-quick, ripping the syringe from the pole with a powerful sweep of its claws before Lemelin could get it out of reach. But the bear was too late. The payload had been delivered. Soon, the bear was lying with its nose flat on the ground, unable to move. Once Matula gave the all-clear, the students descended on the bear, intent and serious as each performed a well-defined role. They still spoke in whispers as they took blood samples, checked its vital signs and prepared to affix the all-important video collar to its neck. Usually, the most painful parts of the procedure – adding an ear tag and removing a tooth – are done when the bear’s slumber is deepest, but in this case, those tasks had been done a week ago, during UC-14’s first capture. One student, Leon Burman, cradled the bear’s head in his lap while he pulled back its lips, using a tattoo gun to leave an identification mark on the gums. Gula lifted the bear’s front right paw, inspecting a raw and red line defining the previous capture’s cable. Gula speculated later that it meant the bear was pulling at its snare more aggressively than most. The team treated it with a first-aid kit. 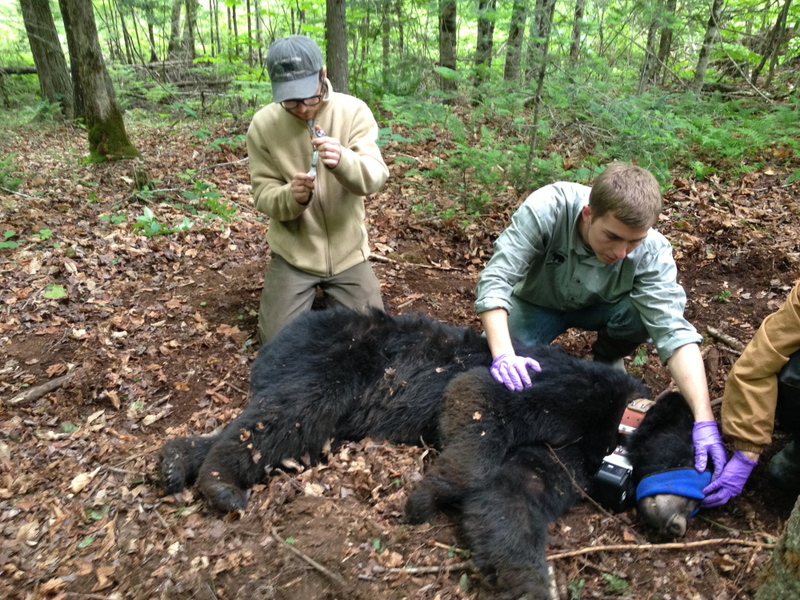 The video collar increased the likelihood of the team making a significant contribution to the study of bears in the state. The study is done in accordance with protocols established by the Maine Department of Inland Fisheries and Wildlife. With their work finally done, the students removed the bear’s blindfold and posed for a quick group picture before retreating back to the logging road. Matula and two students stayed behind, to watch over the bear while it regained its feet and wandered off. About three hours had passed between the discovery of the bear and its release. In addition to generating valuable data, the students are also gaining a valuable learning experience from the study, which Unity bills as the first, and possibly the only, undergraduate bear study in the country. Matula, who has been teaching at Unity since 2011, said the program, which has an annual budget of about $50,000, was put in place to improve recruitment. “It’s the best experience I ever heard of,” Lemelin said.